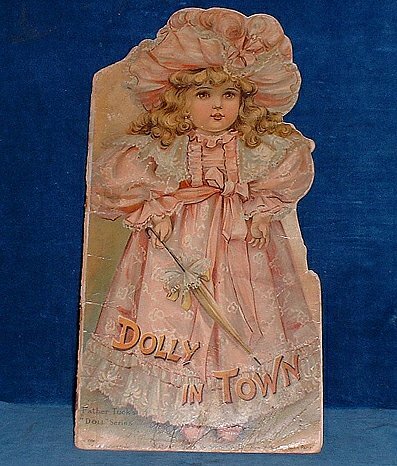 Description: London, Tuck & Sons Ltd. 1910 approx) Chromolith die cut doll + 4 pages of chromolith text illustrations+ line illustrations. . Die cut quarto (36x19cm) card covers (lower outer corner creasing/spine paper chipped off but covers still attached/edges rubbed/back cover plain has damp tide-mark and loss at top for half inch/spine is chipped but intack with covers attached) [14p] Back cover plain with Tuck Logo & publishing details New York-London-Paris. Damp marking does not affect inside at all,nor the front cover One marginal tear without loss a few slight finger marks & original staples a bit rusty but all pages attached except for bottom 1" split. Two captions a bit cropped it sounds wornse than it looks,but a large popular shape book which is often in poor condition or with torn pages due to its size. Here in acceptable good condition. This is NOT a facsimile reproduction, this is the genuine Father Tuck series, Number 1756.